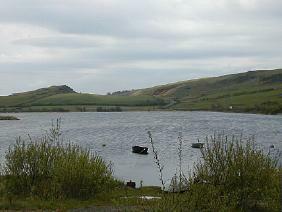 The reservoir lies high in the rolling, grassy hills of North Ayrshire some 6km north of Ardrossan along the B780. Limited parking can be had at the north end (NS 255 480), near the cottage at the junction of the B780 and B781 or at the south west corner at the junction of the B780 and a minor byway. At both locations the loch is close to the road and readily scanned from the parking location. Please take care not to obstruct passing traffic or residents requiring access. The approach roads are often rather busy for cycling safety. Very limited parking at side of busy road, stone wall along roadside restricts viewing. Both ‘B’ roads require care but a safe approach is possible along by-ways from the south. The loch is set in a shallow hollow below the Knockewart Hills. It is of medium size and fringed with reeds. Notable in the area are Tufted Duck, Water Rail, Jack Snipe, Sedge Warbler and Reed Bunting . Wintering waterfowl and migrants find the reservoir to be a useful resting place. In 1999 a Lesser Scaup stayed for a few days. This entry was posted in Locations - North Ayrshire on 28-Jan-2003 .